FROME FM has been announced as a finalist in The People’s Millions, and will appear on TV later this month in a bid to obtain funding for an innovative project. The People’s Millions is a grants programme run in partnership between the Big Lottery Fund and ITV. It asks the public to vote for the projects they want to see supported. And FromeFM will be calling on your votes during the ITV1 broadcast on Tuesday 26th November at 6.30pm, as it goes head to head against a community green project in the Forest of Dean. But first, FromeFM needs your help to be in a promo film to be screened during the broadcast. ITV are coming to Frome on Friday 15th November to film Frome’s bid – and needs crowds of people on TV to show support for the project. FromeFM is asking The People’s Millions to fund three ‘suitcase studios’ – portable studios which can be taken out into the community. This will enable Frome’s children, local clubs, community groups and charities to make their own radio programmes about the things they are passionate about. One of the aims is to encourage people to participate in radio production, and the grant would also fund a trainer to help new enthusiasts. FromeFM station manager Phil Moakes said, “This radio studio in a suitcase has been to disaster areas around the world broadcasting lifesaving information about where to get food and vital medical supplies. It has helped a massive number of people overseas and now we want to use it to help people here too. 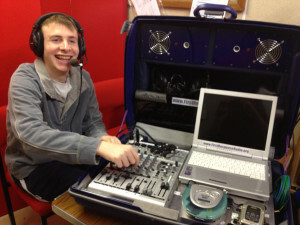 For more details go to www.frome.fm/suitcase to sign up for the FromeFM newsletter giving information on how to vote, when and where ITV are filming, and how to register your club or charity for a demo of suitcase studio. FromeFM will also enter you (or your chosen charity) into a prize draw to be the first to use the suitcase if they win!